I really like the springtime feel of this card! I layered Certainly Celery, Always Artichoke, So Saffron and Vanilla. The So Saffron layer was color embossed by rubbing my So Saffron classic pad across the Perfect Polka Dots Textured Impressions folder, then inserting the So Saffron cs and running it through the Big Shot. I love the look you get by color embossing. I so love the new punches. 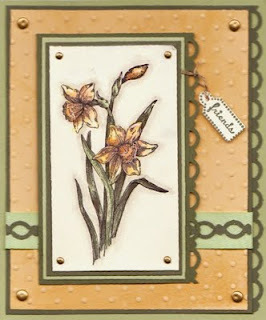 You did outstanding job on the use of these in this card -- love the single swirl on the layer.